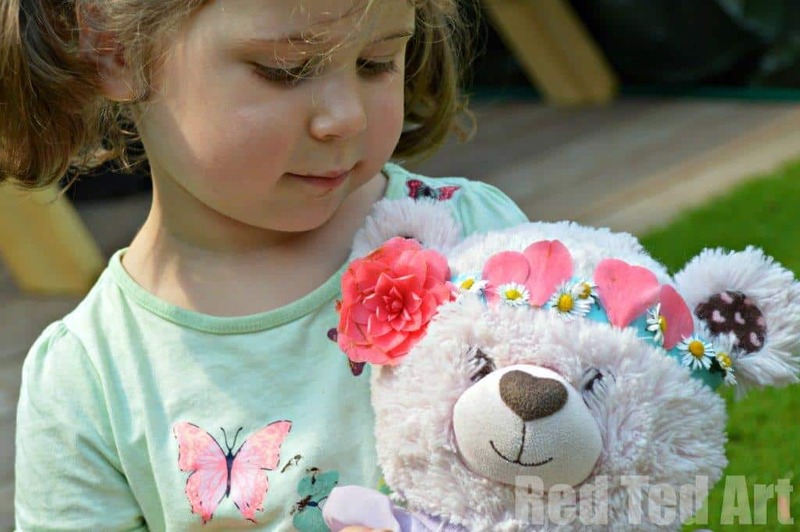 Well… it really IS that time of year – the the trees are blooming, the daisies are sprouting and flowers and blossoms are appearing everywhere – and my little girl, simply cannot resist PLAYING WITH FLOWERS and this weekend we made some easy peasy Flower Crowns for her teddies. It all started many moons ago at my Mother in Law’s house – she always lets Pip Squeak and Red Ted go around the garden and pick lots of pretty flowers for them to take home. This results in hours of petal and flower play once home. Arranging in little vases, sorting by colours, or sticking on paper. It always surprises me quite how long the petals actually last! 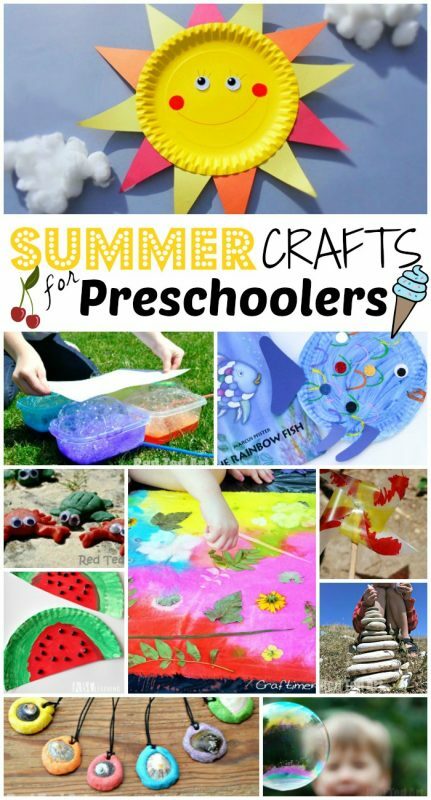 This is such a lovely little easy Summer Activity for Preschoolers! Picking flowers in Granny’s garden is one thing. When we are out and about, the children are only allowed to collect “weeds” (usually Daisies and Dandelions) and any fallen blossom. 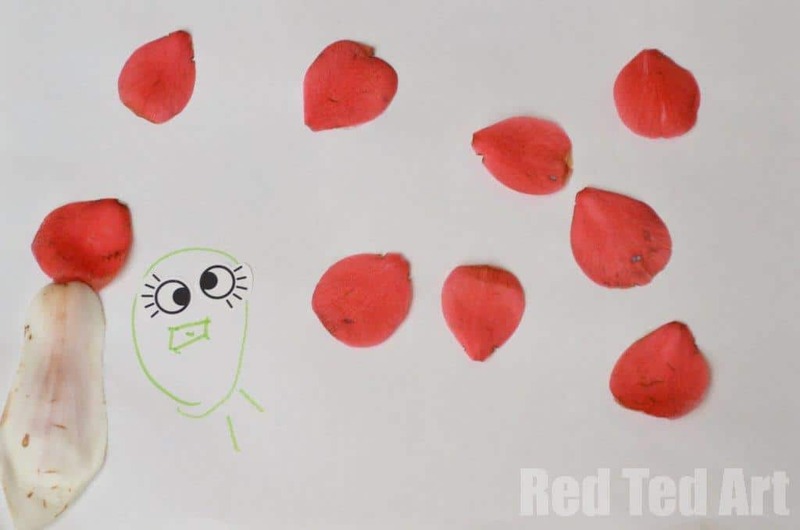 We were super lucky to find bright red flowers on our latest work – some of which had fallen WHOLE from the bush. Pip Squeak LOVES making flower pictures like this. Clearly they don’t last. If you wanted them to last, you would have to press the flowers first We have made these over and over again over the last year or two. 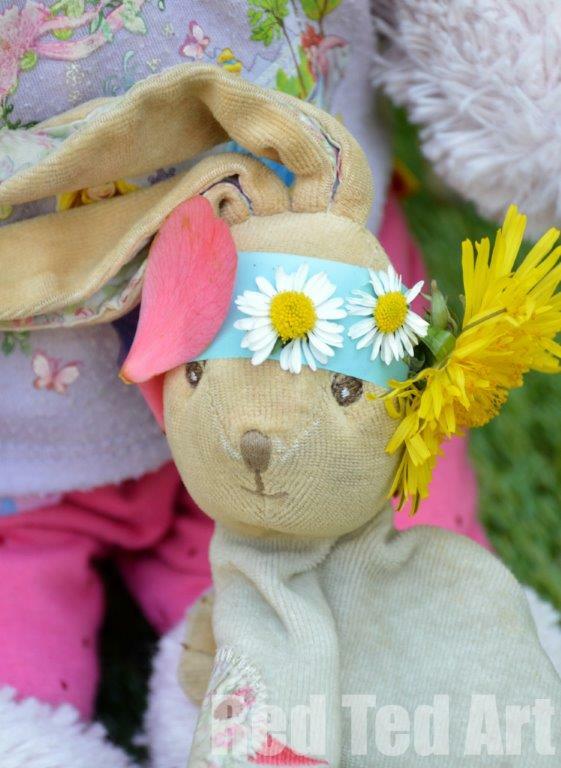 Whilst we were out, I had made Pip Squeak and Red Ted some Dandelion crowns (found in my book – click here if in the UK, or here if international). And Pip Squeak wanted a crown for her bear too. The flowers she had picked didn’t have long enough stems. So I got out some blue tape and wound it round the bear’s head – with the stick side facing OUT. Pip Squeak then added the flowers. We were impressed that it could (just about) hold the large flower too and it looked so pretty. 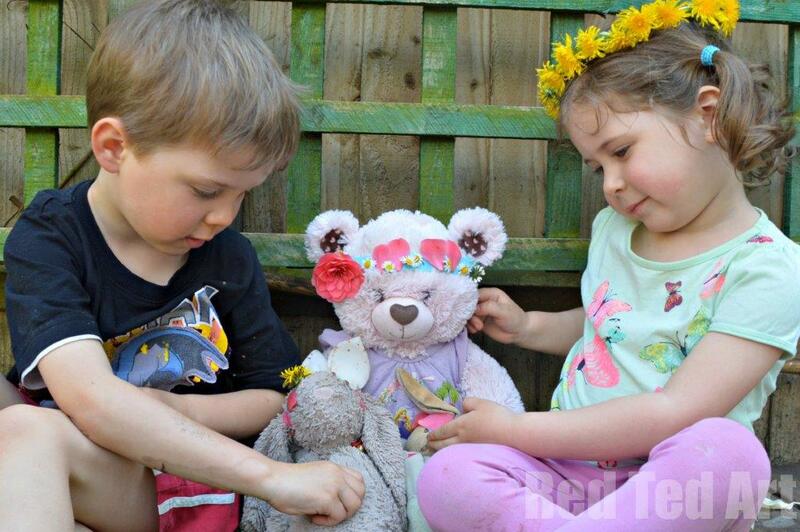 Here cuddle bunny then got a flower crown too… and then Red Ted joined in as well (I love how having a little sister gives him the opportunity to do these activities, he usually pretends he isn’t interested, but loves them really). All the crowns only lasted the day. But that didn’t matter, the kids had gorgeous fun playing with them. (And here you can see Pip Squeak with her crown on). 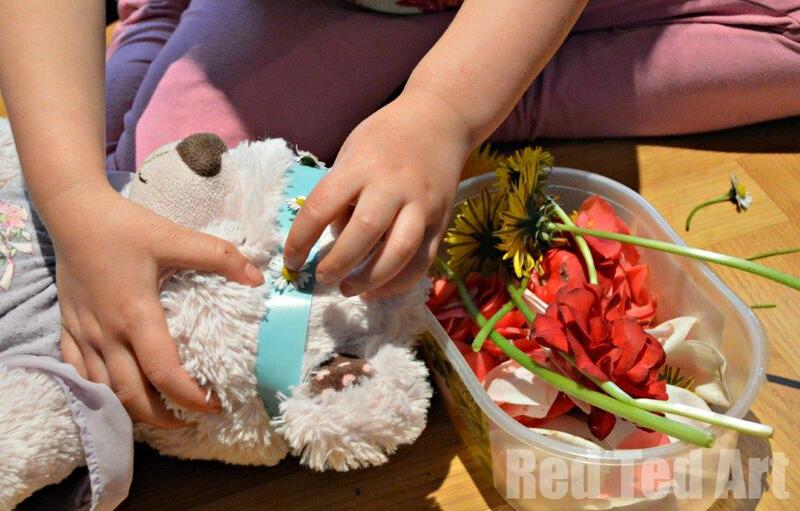 What are your favourite Summer Crafts for Toddlers?